Lehigh is returning one starters from last season: Senior Mackey McKnight (above). The rest of the starting line-up is filled out by newcomers Austin Price, Jesse Chuku, and Tim Kempton as well as Junior Cory Schaffer. Senior Anthony D’Orazio also returns to the team and should be the team’s sixth man. Lehigh will play thirteen out-of-conference games including four games in the Legends Classic before playing eighteen Patriot League contests, four more than last season. Why four more you may ask? 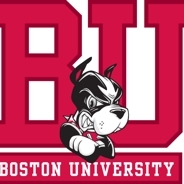 The Patriot League added two more schools over the summer: Boston University and Loyola (MD). 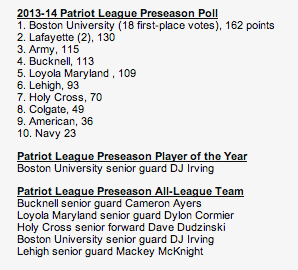 As you can see, Lehigh voted to finish sixth. It will be tough to fill in the shoes of C.J. McCollum, Holden Greiner, and Gabe Knutson, all of whom combined for 4,862 career points and 1,927 rebounds. With seven total newcomers on the roster, this year will start a new era in Lehigh Men’s Basketball. Minnesota is a team voted to finish ninth in the Big Ten preseason poll. The Gophers finished 21-13 (8-10 Big Ten) last season which included a win over UCLA in the NCAA tournament last season AND an extremely impressive 15-2 record at home. This will be the first meeting between Lehigh and Minnesota. Lehigh has never beaten a member of the Big Ten. They have beaten Penn State 11 times, but that was before Penn State joined the Big Ten. It’ll be very exciting to see Brett Reed and the Mountain Hawks return to the court tonight and I’d love to say that Lehigh will start the season with a win for the first time since 2008, but Minnesota will win this one.